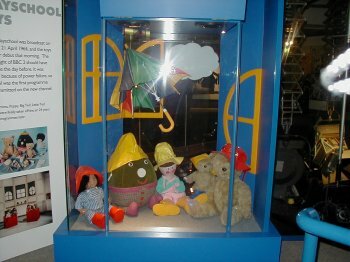 The Play School Toys - Kids TV - Classic programmes from yesteryear. In 1999, I received an e-mail for the Claim To Fame page from Kate Broome. Kate claim's she has the original Humpty Dumpty, star of Play School. Fair enough I thought and I posted the claim. "I sent the museum a mail, and have made a member of the museum crew, called Angela, very distressed. She has passed it to the Head of Visitor Services, and also hopes they will get to the bottom of it soon." As for the Play School toys, I am not aware of the website you mention, perhaps you could let me have the address so that I can check it out. (I've now sent an e-mail introducing the site - Ian T). 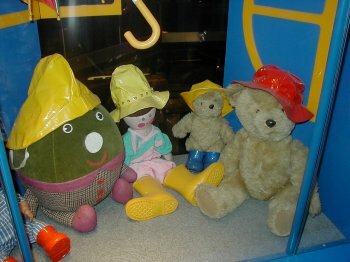 As the Playschool Toys "adopted father" I can confirm that they are the real ones! In fact Humpty and Jemima were a little put out when I told them your news. Big Ted (who knows about these things) suggested that the girl in question might have replicas made by her mother given to the girl as a present. Before Playschool finally ended, to be replaced initially by "Playbus", we were asked whether we would like to provide a retirement home for the toys. We of course said yes, and I personally collected them from TV centre. We also have the three windows (round, square and arched) and the cuckoo clock as well as Dapple the rocking horse. Unfortunately the glass case isn't big enough for Dapple to gallop round in, so we have her in a rocking horse sanctuary near the museum. You can rest assured that these are the "real" toys - in fact Little Ted said that he would recognise Humpty's snoring anywhere. You also asked about Hamble, indeed there seems to be a great deal of mystery about what happened to her. This is mainly because we have not told the rest of the toys what happened (nor indeed the viewers) as it would probably cause distress. Hamble suffered from a rare illness called "seam failure". Despite regular re-stitching she eventually became too unstable to use was retired to be replaced by Poppy. No one seems to know what eventually happened to her. So, where is Hamble? Jacqueline and friends are starting a nationwide hunt so if you have any information, let us know at the usual address (info@kids-tv.co.uk). Thankfully, disappearing toys doesn't happen all the time, despite what you may hear so please, don't have nightmares. "Well I was waiting on several replies from the BBC. I started by trying to find an e-mail address for their customer services, how hard do the BBC make it to contact them. (It wasn't this hard in the good old days of Take Two - I wrote to Philip Schofield and my letter was read out within two weeks) The customer service thing was, in a word, crap. "So next stop was an e-mail to CBBC, they gave the name and address of the Head of Children's programming who they thought might be able to help. Well he couldn't. I finally received a letter yesterday from the people in pre-school. "They think that letter will put my mind at ease. 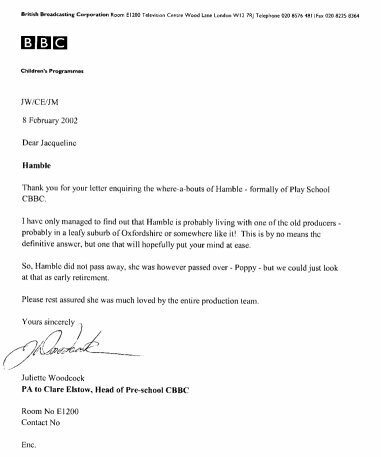 Find me the names and addresses of every person who worked on Playschool since the disappearance of Hamble and that will put my mind at ease. "I think a radio campaign may be in question. My guess would be that The age the people would be would mean them to be Radio 2 listeners (doubtful radio 1) I think Terry Wogan, Steve Wright and Jonathon Ross would be the best bet to help."